Like many bloggers, the gaps between my postings have been varied and often far too long. I have sworn to myself that I’ll never use the words “sorry I haven’t posted for ages”, “wow, I’m back at last”, “It’s been far too long”, or similar. I’ve spent some time considering how to write, when to write, how often to write, illustrations to include. I’ve known that I haven’t written enough but haven’t been clear on how to resolve that issue. Writing has formed a significant part of my working life, so I’m not a novice nor am I daunted by the blank page. In the early 90s I was working with Jeremy Myerson (an accomplished journalist and author, founding editor of Design Week, for many years a Professor at the Royal College of Art) on a project and asked him how he managed to keep on writing. “Sheer technique” he responded. He wasn’t being arrogant at all, just helpful. The meaning was clear: just write. And so I did, and his advice has stood me in good stead both in my professional life, and my personal life too. The biggest stumbling block that keeps me from writing and publishing more is that I spend much of my working life sitting in front of a computer so the last thing I want to do in my time outside work is … to sit in front of a computer. I know some people blog from iDevices but that’s not for me. I need a proper screen and keyboard to produce anything (at least at this stage in my blogging life). And a second block is that I tend towards perfectionism, possibly putting off writing/publishing posts because I can’t see a long enough window of time to “get it right” (whatever “right” is – to misquote Prince Charles in his famous engagement interview so many years ago). But this morning I received some photos from Steve, the groundworker/heavy machinery guy, which he took at the end of his work yesterday. And I want to share them with you. So, here I am, publishing a new blog post two days’ running (and writing it at my desk in front of my computer in the middle of the working day). No worries; I shall just work on a little later this evening to catch up. The stump grinder, and stumps still to be worked on. 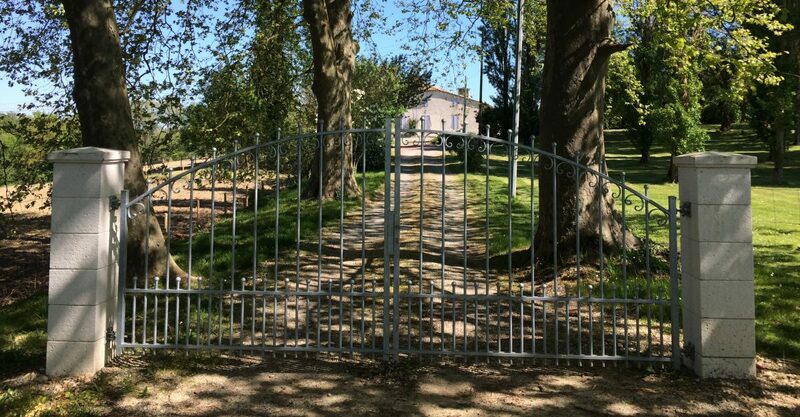 The white gates are our neighbour’s. And the job finally completed, looking north towards the house. We are absolutely delighted with what has been achieved by the team and really feel ready to move on. This last picture shows a little under a third of the garden, what we describe (at the moment at least) as “the front garden”. The two big remaining trees on the right of the picture are both ash, in good condition, and will give us an upper storey to that area of woodland garden. The laurel hedge in the background is a boundary (forming a bit of a dog-leg in our plot) and in front of that we will be creating a new parking area (screened by new hedges from the rest of the garden) with an ornamental garden and petanque court in front of that. The shadows on the left come from five large and ancient plane trees, dating from Napoleonic times, which appear to be very strong and healthy. Between the plane trees on the left and the woodland garden on the right we will have an open area of lawn which will give sweeping views from the house. Its exact position still to be determined, there will also be an area where we will plant spring bulbs to naturalise in the grass and encourage wild orchids to seed themselves. In the foreground we will plant a hawthorn hedge which we will keep fairly low to keep the view open. Friends have successfully established hawthorn and I was very inspired by Arne Maynard’s hawthorn hedges at Allt-y-Bela when I visited last spring. Which varieties of trees would you plant in the new woodland garden?